(Bloomberg) -- Mitsubishi UFJ Financial Group Inc. is seeking fresh opportunities to buy asset managers following last year’s $2.9 billion Australia deal, as Japan’s biggest bank tries to make up for grim prospects at its domestic lending business. “We said we would like to spend about 1 trillion yen ($9 billion) two years ago, and we haven’t spent that much yet,” new Chief Executive Officer Kanetsugu Mike, 62, said in an interview. He said the bank will also consider purchasing asset finance portfolios if opportunities arise that are similar to DZ Bank’s aviation unit, which MUFG agreed to buy last month. MUFG has been the most aggressive Japanese lender in snapping up overseas assets, as it diversifies business and expands in markets such as Southeast Asia to counter rock-bottom interest rates at home. The bank last October agreed to buy Commonwealth Bank of Australia’s global asset management arm for A$4.13 billion ($2.9 billion), its largest deal in that industry. MUFG’s aspirations to purchase asset managers were earlier revealed by trust banking unit chief Mikio Ikegaya in a 2017 interview. 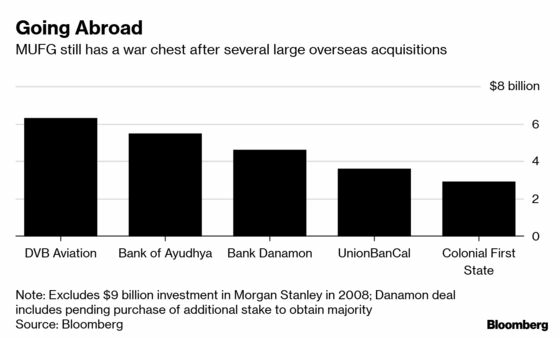 The lender has said it wants to expand assets under management to about 100 trillion yen, up from about 82 trillion yen including the CBA unit, known as Colonial First State Global Asset Management. 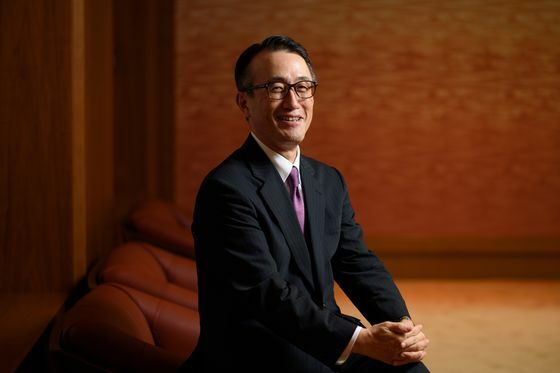 At the same time, Mike, who succeeded Nobuyuki Hirano as CEO on April 1, said MUFG doesn’t see the need for further large-scale deals targeting commercial lenders, pointing out that deals in Southeast Asia in recent years are sufficient. It bought Thailand’s Bank of Ayudhya Pcl in 2013 and is now in the process of acquiring more than 70 percent in PT Bank Danamon Indonesia. In its three-year business plan ending in March 2021, the bank said it will boost the profitability of its lending portfolio by expanding in areas such as leveraged, acquisition and aviation finance, while disposing of low-return assets. It has offloaded stakes in U.K. investment firm Standard Life Aberdeen Plc and Brazil’s Banco Bradesco SA in recent months. Mike also signaled that he will strengthen the bank’s compliance team to keep up with global regulatory requirements. “We’ve made a lot of progress, but there remain parts we need to bolster,” he said, when asked whether the lender plans to hire more compliance staff. As a result of its overseas expansion, MUFG has faced increasing scrutiny by authorities, especially in the U.S. In February, the Office of the Comptroller of the Currency ordered it to fix deficiencies in its adherence to anti-money laundering and bank secrecy rules at its U.S. branches. The OCC has supervised MUFG since the bank switched oversight from the New York Department of Financial Services in November 2017. The DFS objected to that move, saying it was made unlawfully to pursue “regulatory arbitrage.” MUFG, which has maintained that it made the switch to consolidate its U.S. operations under one Federal agency, has sued the New York regulator to prevent it from conducting further supervision. To better deal with U.S. authorities, MUFG shifted its global headquarters for financial crimes compliance to New York from Tokyo in 2017, giving it better access to the market for personnel with relevant experience and expertise. The Global Financial Crimes Division has a staff of about 1,000. Efforts to improve compliance are costly. The bank expects regulatory expenses will grow by 35 billion yen in the three years to March 2021. But Mike, who spent about half of his four-decade career at the bank outside Japan, said such spending is a must, adding that the number of compliance officers at MUFG isn’t particularly large compared with those at other global financial institutions.